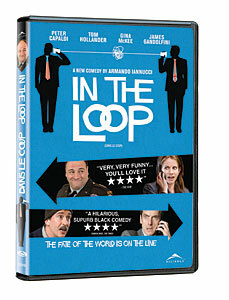 In The Loop was released on DVD in Canada on November 10 by Alliance Films and will come out January 10, 2010 in the US. You can help Toronto Screen Shots by buying it from Amazon.ca or Amazon.com. 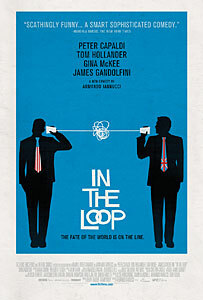 In The Loop (Director: Armando Iannucci): On this side of the pond, the name Armando Iannucci likely doesn’t ring a bell, but for fans of British comedy, the man is considered a genius. His collaborations with Steve Coogan include the classic Alan Partridge shows (The Day Today, Knowing Me, Knowing You, I’m Alan Partridge). Most recently, he’s been writing and directing a blazingly fast and funny series called The Thick of It, which mines the comedic territory of political media handlers working for the British government. In The Loop takes almost all the actors from that show, mixes up the characters a bit, and places them in the midst of the run up to the (unnamed but blindingly obvious) Iraq war in 2003. Peter Capaldi returns as Malcolm Tucker, the whipsmart press secretary with a mean streak. I’ve never heard more creative swearing in my life, and if you’re offended by “f-bombs” then this film is definitely not for you. But it’s my firm belief that no one can curse more creatively than our friends from the British Isles, and every character reaches for the stars in this very funny movie. Simon Foster is the minister for international development who puts his foot in his mouth by making off-the-cuff remarks about the possibility of a war. The press runs riot and Malcolm Tucker tears young Foster a new backside. The rest of the film follows the bouncing minister as he’s used by pro- and anti-war factions in both the UK and the US. He continues to fudge his “lines” and the resulting mess makes for some very funny situations. While The Thick of It confines itself to English politics, In The Loop creates similar characters on the American side, with James Gandolfini clearly enjoying himself as a peace-loving general who nevertheless threatens to kill several of his political opponents. It’s nice, too, to see Anna Chlumsky (best known for 1991’s My Girl) return in the role of a young aide to an anti-war assistant secretary of state. Overall, though, the Brits get the best lines (as might be expected) and one of the funniest scenes is when Malcolm Tucker the angry Scot actually brings in an even angrier Scot to handle yet another press leak. Steve Coogan has a small cameo as an irate local man trying to get his mother’s garden wall fixed in the midst of an international crisis. Though I would have loved to see more of him, giving him a bigger role might have unbalanced the mostly star-free cast. In The Loop will be riotously funny to anyone with even a passing interest in the workings of politics. Though it’s not anything special cinematically (think a longer episode of The West Wing), there’s enough crackling dialogue to keep you laughing all the way through. In fact, it’s a perfect film for DVD since you may find yourself having to rewatch certain scenes, either because the accents are slightly unintelligible, or because you were laughing so hard you missed the next piece of dialogue. This was a film whose trailer let it down because it had to cut out all the swearing. So I’ve included instead an actual clip. Be forewarned, though, that this contains some many naughty words. This entry was posted in DVD and tagged politics, satire, uk, war. Bookmark the permalink.